We’re so excited to be launching our brand new range tonight on Hochanda! These 5” x 7” die-cut and emboss folders are a fantastic new concept that allows you to cut and emboss a design with just one pass through your die-cutting machine. Bring these beautiful designs to life in one easy step, using the carefully formulated plate combination provided and create a project that really pops! The embossed detail is perfect for inking and colouring and you can use the cut-out shapes to create a matt and layered effect or even add your own touch to the cut-out areas for a beautifully framed piece. Check out this easy to follow tutorial from Janine to see just how easy they are to use. Trim a piece of stamping card to roughly 7½” x 7”. Add a little glycerine to your glass mat, and work it into your blending tool. Scribble the Meadow Aqua pen onto your work surface and work it into your blending tool and then add it to your white card into 3 or 4 areas. Repeat the process with the other 2 coloured pens, making sure you change your foam applicator each time. Keep adding the colours until you get the desired look you want. Heat set this with your heat gun to ensure it is dry. Trim the card to fit your embossing folder and keep the spare portion for later. Add Versamark ink to the top section of the folder making sure you add plenty. Wipe over the surface of the coloured card with an anti-static bag to remove any residual grease etc. Carefully position your card inside the folder and run it thought your embossing machine. 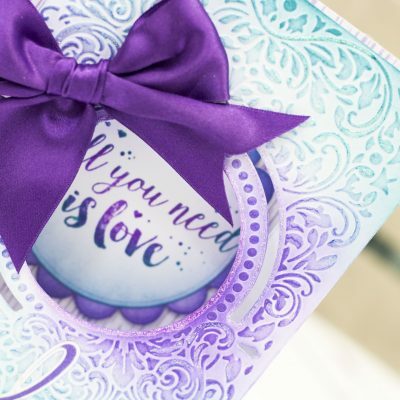 Carefully remove the card from the folder and quickly add the embossing powder. Tap off the excess and using a heat gun to melt the powder. Trim and add a piece of complementary coloured card to the card front, then attach the glittered panel over the top using foam pads. Die cut the sentiment from the spare piece of coloured card, and glue it inside the circle aperture. To complete the card add a few gems. Don’t forget to tune into Hochanda at 6pm tonight to see more incredible inspiration! Can’t wait, check out our gallery!